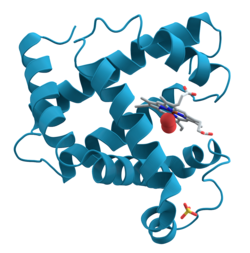 ^ PDB 1MBO; Takano T. Structure of myoglobin refined at 2.0 Å resolution. II. Structure of deoxymyoglobin from sperm whale. J. Mol. Biol. March 1977, 110 (3): 569–84. PMID 845960. doi:10.1016/S0022-2836(77)80112-5.